Given that RT = TS, ∠1 = 2, ∠2 and 4 = 2 ∠(3) Prove that ΔRBT  ≅ ΔSAT. To prove that ΔRBT ≅ ΔSAT. 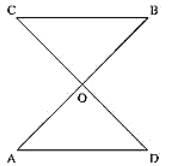 Two lines AB and CD intersect at O such that BC is equal and parallel to AD. Prove that the lines AB and CD bisect at O. Given that lines AB and CD Intersect at O. 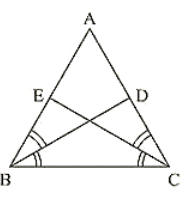 We have to prove that AB and CD bisect at O. Since AB end CD intersect at O. Lines AB and CD bisect at O.